About halfway through my residency, I had to make an overnight trip to Glasgow. I left the reserve in the early evening, so it was nearly ten by the time my train pulled in under Central Station’s glass roof and, given the late hour, I decided to take a taxi back to my flat on the south side of the city. I confess that normally on these journeys I bury myself in my phone, but that night as the black cab was making its way across The Clyde I looked out of the window and saw the full moon rising behind the chimneys of the Strathclyde Distillery. Their smoke partially obscured its face, but this only served to heighten the drama of the sight: surrounded by a halo of clouds the moon loomed large over the city, mirrored in the flowing water of the river. But I realised a sight was all it was. As the moon slid behind a dark cloud and out of sight, there was no perceptible change in light: the sodium lights lining the pavement continued to cast their orange glow onto the paving stones, floodlights continued to light up huge billboards, and LEDs continued to flash from the window of the chip shop. The moon had been hanging there in the sky like a giant paper lantern, but the city itself was giving off so much light, the moon’s light never touched the ground. Passing over The Clyde that night, I was for the first time struck not by the presence of the moon, but by the absence of moonlight. The writer James Attlee suggests that in the city, “it is easy to forget the presence of the moon when you are distanced, immunised against its touch.” In his 2011 book Nocturne, Attlee writes of his search for experiences of moonlight: travelling to the islands of Japan, the lip of Mount Vesuvius, and the deserts of Arizona – places where the nights are still dark and the skies are not clouded by the light pollution that blankets our all our major cities today. Luckily for us, we do not need to travel far to find these dark skies, as the skies here in Dumfries and Galloway are amongst the darkest in Britain. Around thirty miles northwest of here lies the Galloway Forest National Park, the United Kingdom’s first designated Dark Sky Park, where, I am told, on a clear night the Milky Way can be seen with the naked eye. Mersehead is not part of the official Dark Sky Park, but believe me the nights here can be very dark indeed. On a clear night the skies here are thick with stars, so thick in fact that even the brightest, most recognisable of the constellations, The Plough, can become difficult to discern. On my second night here in April, like tonight the night of a new moon, I decided to venture outside to try and photograph some of these stars. Though the sky was thick with stars, the darkness on the ground felt oppressive, forbidding, like it held some hidden menace. Every sound – the rustle of leaves, the beat of a wing – rang much louder and every distant light seemed no more that a field away. I found myself anxious, on guard, and reluctant to venture too far from the small pool of light spilling from the front door, and its perceived safety. Having experienced this deep darkness, the next week when our warden Rowena offered to take us out at night to look for natterjack toads – tiny nocturnal creatures whose mating call reverberates across the reserve – I expected to stumble my way across the merse by torchlight; hopefully avoiding the pockets of deep water and mud that litter the fields. So when it was time to set out, I, bundled in several layers of waterproof clothing and wellington boots, made my way outside with a newly-purchased torch clutched tight in my hand; only to find, to my delighted surprise, the darkness was not as absolute as I had imagined it would be. The landscape appeared almost blue, its features picked out by silvery moonlight. The moon above us was only in its first quarter, but it was more than enough to make our way down to the lagoon without the aid of a torch. 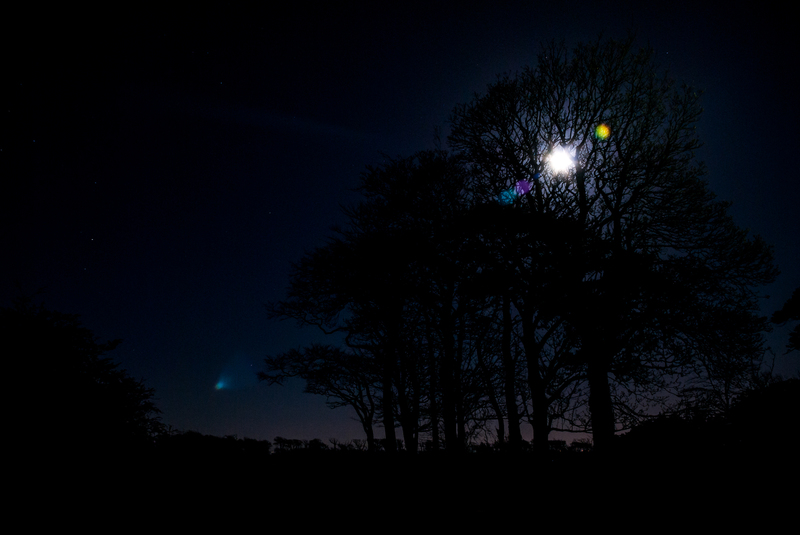 A week later, in the days just before and after the full moon I saw rise in Glasgow, the night time landscape was so brightly illuminated I could see clearly right across the fields in all directions, and even read the dials on the back of my camera. As I observed in one of my blog posts written shortly after these excursions, as a photographer it is no exaggeration for me to say that light is essential to my artistic practice. Indeed, the word ‘photography’ quite literally means to ‘draw with light’, and this is true whether a photograph is captured on film or by a digital sensor. During my time here, I not only found myself acutely aware of the changing light on the reserve, but that my relationship with natural light, and with moonlight in particular, was very different to the one I have in the city. As Attlee, and many others have observed, in the city it is easy to lose track of the monthly cycles of our lone natural satellite, but out here, where the urban sky glow is little more than a smudge on the horizon, these cycles once more become palpable. In this I felt I maybe had something in common with the geese. I am sorry they have not arrived yet, because for me they have always been something of a fixture of the reserve. They were here when I first visited back in December last year, and in April they left only a few days before I did. The whole time I was here I knew the geese would soon be leaving, and I often wondered how it is they know when to make this journey. The factors that influence migratory birds are complex, but one thing that is known to influence them is light; specifically the amount of light they are exposed to each day between sunrise and sunset: what scientists call photoperiod. In his book The Snow Geese, William Fiennes compared the coming and going of the swifts to a solar eclipse: a revelation of planetary motion and a reminder of the cyclical nature of life on our planet. It is a powerful metaphor and one that serves equally well for the geese. 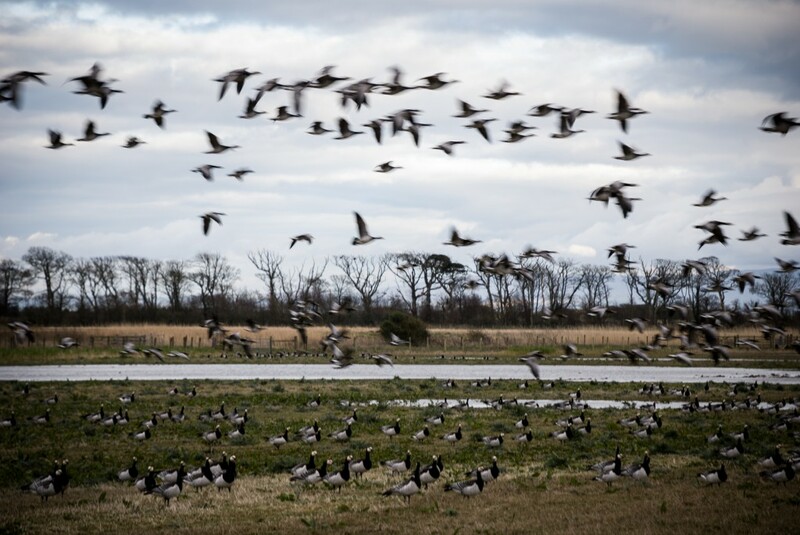 Every autumn the geese fly south to the shores of the Solway Firth, and every spring fly north again to their Arctic home in Svalbard: a round trip of over three thousand miles. Their coming and going from Mersehead – and indeed from Svalbard – marks the changing of the seasons, marks time just as the moon as done for centuries. Every Wednesday, Roseanne and I would go out with Rowena or Eric to count the geese resting in the fields around Mersehead. On these counts – and indeed on many of the surveys we took part in here – the reserve telescope was an essential tool to help us pick out distant birds. On clear nights I often found myself gazing at our celestial neighbour through this same telescope, itself a descendant of the instrument Galileo used to make the first known drawings of the lunar surface; and through which I took all the photographs featured in my work Reported Sightings. Unlike Attlee, I was not looking for an experience of moonlight when I came to Mersehead, but it was precisely the unexpectedness of its influence on me and my work that has made it such a powerful motif of both the passage of time, and my own relationship with nature. My only fear, is that by focusing this talk so intently on my experience of night, I have underplayed the influence of the birds, and the other wildlife that call Mersehead home. The sight of thousands of barnacle geese as they simultaneously take to the skies, and the beat of their wings as they flew directly over my head. Holding a natterjack toad in my hand for the first time, and feeling its tiny heartbeat pulse against my palm. Watching a little egret fishing from the Meida Hide, and finally capturing a photograph after weeks of failed attempts. Seeing three roe deer bounding across Kirkconnel Merse in the early morning light, and a red squirrel twisting its way up the trunk of a tree. Hearing the dawn chorus ring out across the reserve every morning, and the haunting sound of snipe winnowing in the night. I must confess that I nearly did not apply for this residency, for as a PhD student there is always worry connected with taking any time away from developing my thesis and portfolio. All I can say is that I am glad I changed my mind, because it has been an amazing experience, and I hope this shines through in the work. We have a few minutes for questions, so if there is anything you would like to ask me please do, otherwise enjoy the rest of your evening. And, later tonight, if the clouds clear, remember to take a moment and look up. 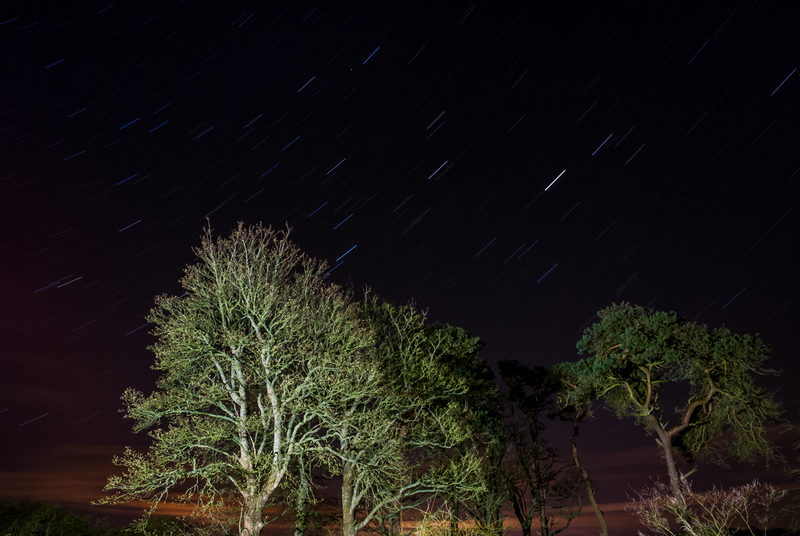 CORRECTION: This post originally referred to the Galloway Forest Park as “the United Kingdom’s only dedicated Dark Sky Park”, this should have read “first dedicated Dark Sky Park”. James Attlee, Nocturne: A Journey in Search of Moonlight. London: Penguin, 2012. Paul Bogard, The End of Night: Searching for Natural Darkness in an Age of Artificial Light. London: Fourth Estate, 2014. William Fiennes, The Snow Geese. London: Picador Classic, 2015. Chris Yates, Nightwalk: A Journey to the Heart of Nature. London: William Collins, 2012.